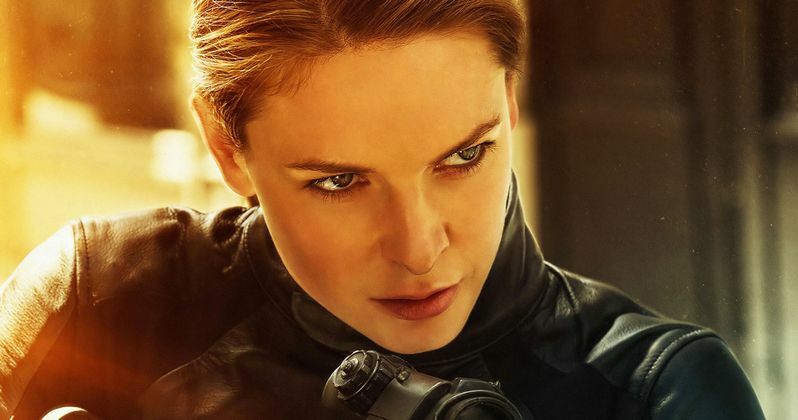 Rebecca Ferguson has chosen to accept her next mission, as she'll return as Ilsa Faust in Mission: Impossible 7. The actress made her debut in 2015's Rogue Nation, the fifth entry in the franchise, and the first to be directed by Christopher McQuarrie, who is set to write and direct the next two installments. With that in mind, it's not terribly surprising to learn that Ferguson will return, but for fans of the recent entries in the series, it still surely comes as welcome news. The reveal was made by Rebecca Ferguson during a recent interview on a British talk show. The 35-year-old actress has been promoting her latest movie, The Kid Who Would Be King. Unfortunately, that hasn't been the hit that the recent M:I movies have proved to be. But that's another story entirely. Toward the end of the interview, she was asked if we'll be seeing her return in the next installment. Here's what Ferguson had to say about it. As the actress mentions, she'll also be starring in this year's sequel to The Shining, Doctor Sleep. But, perhaps more importantly, Ilsa will at least be back for Mission: Impossible 7. We recently learned that Christopher McQuarrie and Tom Cruise have locked down a deal to shoot both 7 and 8 back-to-back. Not to get grim, but it's possible that Ilsa may not necessarily make it to the eighth installment, depending on how things turn out in the next movie. But we'd guess that as long as Ilsa is alive, she'll be joining Ethan Hunt on his world-saving missions. Christopher McQuarrie had been looking at taking on other gigs at rival studios, including a DC movie for Warner Bros. However, following the success of last summer's Fallout, which went on to become the most successful entry in the Mission franchise to date bringing in $791 million worldwide, to go along with widespread critical acclaim, Paramount did what they needed to do to keep the team together. McQuarrie is currently working on the scripts for the next two movies and, assuming all goes well, they will begin shooting later this year after Tom Cruise wraps up filming on Top Gun: Maverick. The franchise kicked off in 1996 and, amazingly, has improved with time and has gone on to become a true cash cow for Paramount. To date, the six movies have grossed $3.57 billion worldwide, with the series trending up, in terms of its earnings ability. The studio has already locked down release dates for Mission: Impossible 7 and Mission: Impossible 8, which will arrive July 23, 2021, and August 5, 2022, respectively. We're still awaiting further casting confirmation, but it's presumed that Simon Pegg and Ving Rhames will also return. And, maybe now that Jeremy Renner is done with Avengers: Endgame, he can rejoin the team as well. This news was previously reported by Metro.